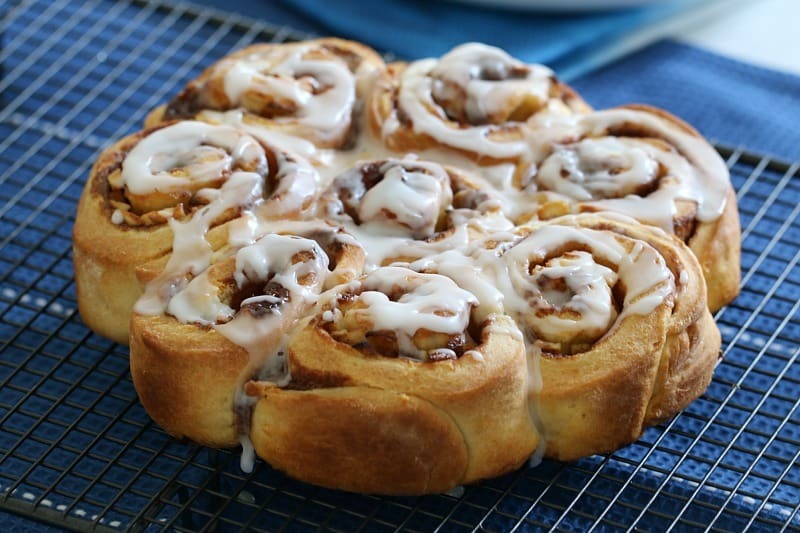 These Apple & Cinnamon Scrolls take 10 minutes to prepare, require no proving time at all… and taste amazing! My latest cooking obsession is definitely scrolls. And sweet scrolls in particular. I have no idea why, but all of a sudden I am LOVING them… and trying every possible flavour combination. To be honest, it’s really not a bad obsession to have. 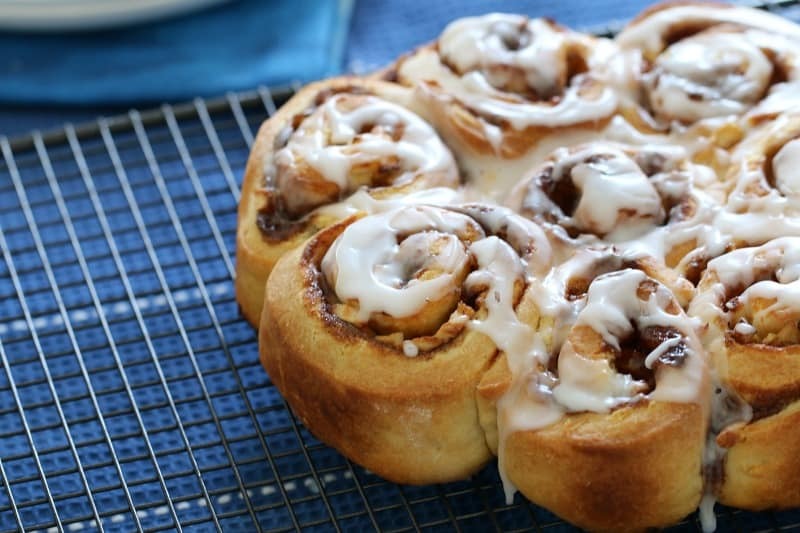 Anyway, like pretty much everyone in the world, I am a big, big fan of cinnamon scrolls. 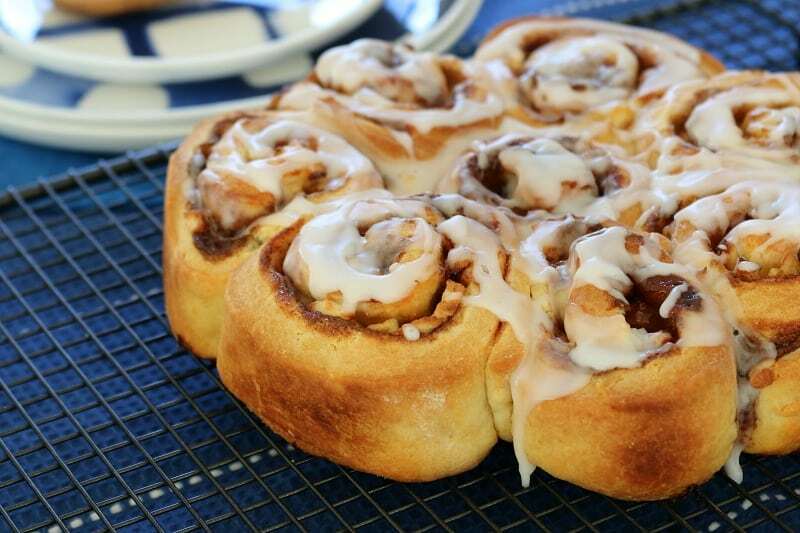 I mean, come on – cinnamon, brown sugar, drizzled icing… drool! But I honestly think that I like these Apple & Cinnamon Scrolls even better. Seriously. 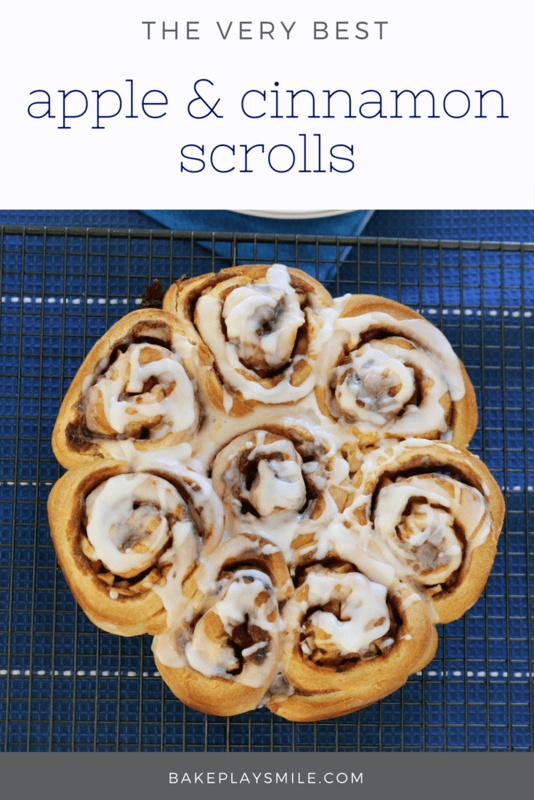 The thing that I love the most about these scrolls is that they take only a few minutes to prepare and you don’t need to leave the dough to rise. Nope, you just whip the dough up, roll it out, add your yummy fillings and bake them straight away. And no waiting around is always, always a good thing. Ohhhh and when these babies come out of the oven, it’s time to make them even better. Yep, it’s possible! Simply make a drizzly icing from icing sugar and boiling water and then spoon (I really mean ‘pour’) it over the top of the scrolls. OMG you cannot beat these delicious little things. 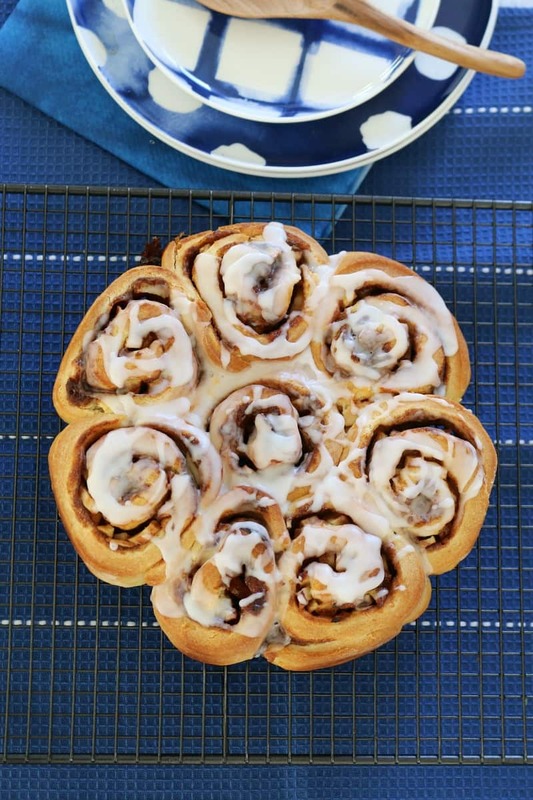 These Apple & Cinnamon Scrolls make a great lunchbox treat. BUT whatever you do, make sure you keep at least one (ahem or three) for yourself. Eat them warm or cold… either way they’re absolutely delicious. Oh and you can totally freeze them as well. Simply pop them into an airtight container and freeze them for up to 3 months. I’m telling you, having scrolls in the freezer is pretty darn fabulous when you get a mega mid-afternoon craving. And so there you have it… the first (of many!) 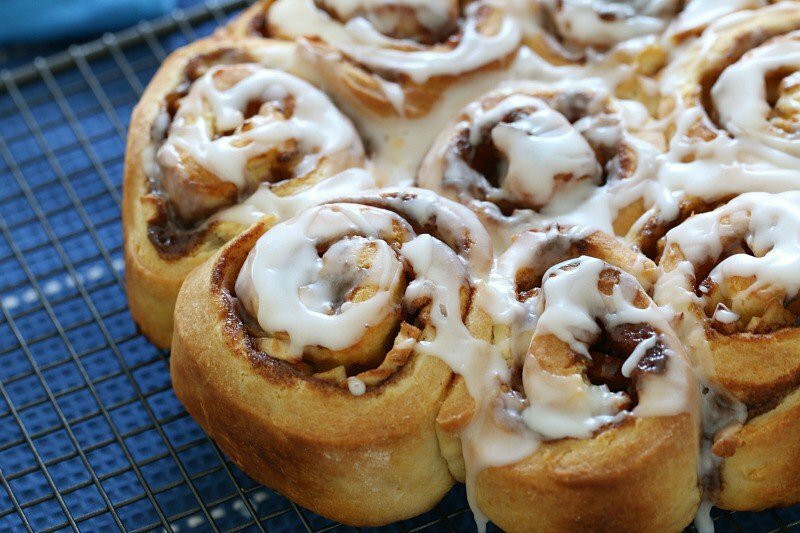 sweet scroll recipes. I can tell you, there is going to be a whole lot more scroll-y goodness happening around here in the next little while. Mmmm carbs – get in my bellllllyyyyyyy! 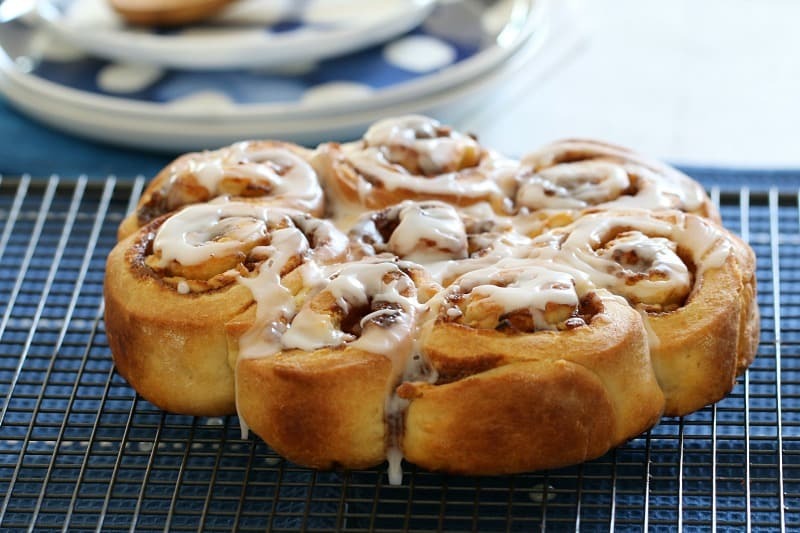 These Apple & Cinnamon Scrolls take 10 minutes to prepare, require no proving time at all... and taste amazing! Plus they can be frozen for up to 3 months. Lightly grease a 20cm round cake tin and set aside. Rub in the butter in using your fingertips. Add the milk and mix to a soft dough. Knead on floured surface until smooth. Roll the dough out into a 5mm thick rectangle. Place the room temperature butter, brown sugar and cinnamon into a bowl. Mix with a spoon until creamy and smooth. 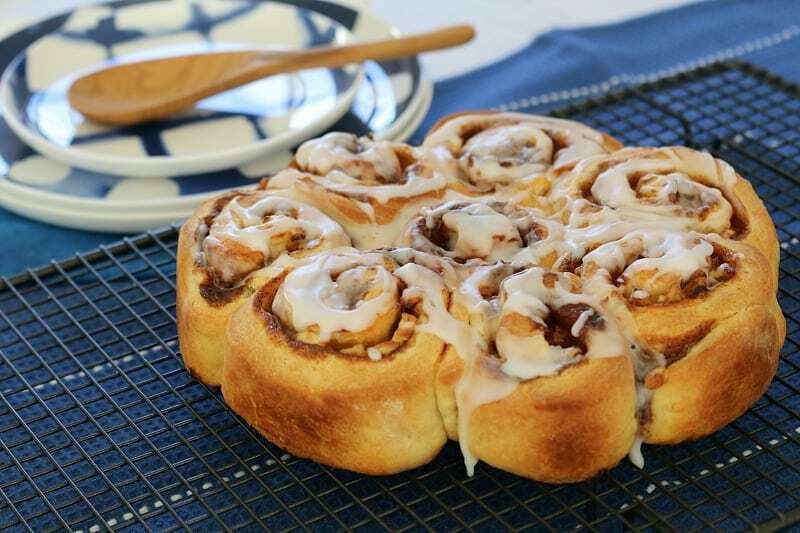 Spread the cinnamon butter mixture onto the dough. Sprinkle over the chopped apple. Roll the dough up into a tube (lengthways). Use a sharp knife to cut the roll into 8-10 pieces. Place the pieces cut side up into the prepared cake tin (allow the rolls to touch one another as this will help them to rise). Place the icing sugar and 2 tbs hot water into a bowl. Mix until a smooth paste forms. If the mixture is slightly runny, use a spoon to drizzle it over the buns. If the mixture is still too thick, add another tablespoon of hot water and mix for a further 10 seconds. 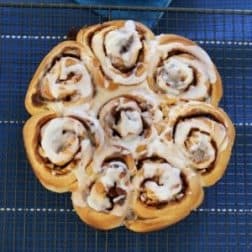 These Thermomix Apple & Cinnamon Scrolls take 10 minutes to prepare, require no proving time at all... and taste amazing! Plus they can be frozen for up to 3 months. Place the cold butter and self raising flour into the Thermomix bowl. Mix on Speed 5, 10 seconds. Scrape down the sides of the bowl and repeat 2 more times. Mix on Interval (knead) function for 1 minute (whilst pouring in the milk). Sprinkle some extra flour onto a board or bench. Place the room temperature butter, brown sugar and cinnamon into the Thermomix bowl. Mix on Speed 4 for 20 seconds. Scrape down the sides of the bowl and repeat. Place the icing sugar and 2 tbs hot water into the Thermomix bowl. Mix on Speed 6 for 10 seconds. Scrape down the bowl and repeat 2 more times. These look ah-mazing! We were at the mall yesterday and they were selling scrolls for $7 EACH! Can you believe it? I’d much rather come home and bake a batch of these! Oh wow these look so good Lucy, I haven’t had a scroll in years! These look dangerously easy to make too! These are full of deliciousness! First time making them too! It did take a bit longer to cook but honestly, who cares? As long as my family including myself enjoyed it, this recipe will be used again Thank you!